Finishing the Ribs: Now it's finally time to take the ribs off of the form and prepare them for gluing on the top and back. The first step is to split the blocks loose. On the corners, I try to remove as much extra wood as I can right away. Removing the Mold: Anyone who's taken a tire off a rim knows that sometimes it's possible to do the seemingly impossible, in this case, pulling the larger mold out through a hole that's smaller than it is. I start with one c-bout, pulling it outwards, which expands the rib set just enough to get one corner off. Then I work my way around from there. The Mold Removed: In this photo, all that's left to remove from the mold is the lower bout. Finishing the Inside of the Ribs: With the mold out of the way, the blocks and linings can be trimmed to their final shapes. Gluing on the Back: The back is glued on first. Since it's critical to get the corners aligned just right, and the c-bouts are difficult to push around, I get the c-bouts accurately positioned and clamped first; then I move on to the upper and lower bouts. 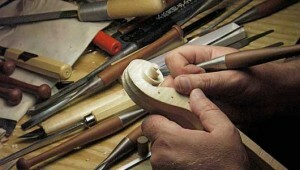 Rounding the Edges of the Top: As with the back, a small plane and files are used to make two 45-degree bevels on the squared edge of the viola's top. In turn the angles are shaved off those bevels, resulting in a microscopically-faceted edge which can then be smoothed and rounded with sandpaper. After the edges are rounded, the scoop inside them is re-scraped to define the high point of the edge. Closing the Body: The last thing to do before making the neck is to glue on the top. There will be a small amount of detailing done later, after the neck is set, but the body is now essentially finished!